I absolutely love entertaining for the Oscars! It’s a night to gather in your living room with friends and family for some good at-home entertaining, centered around the movies we loved throughout the year! 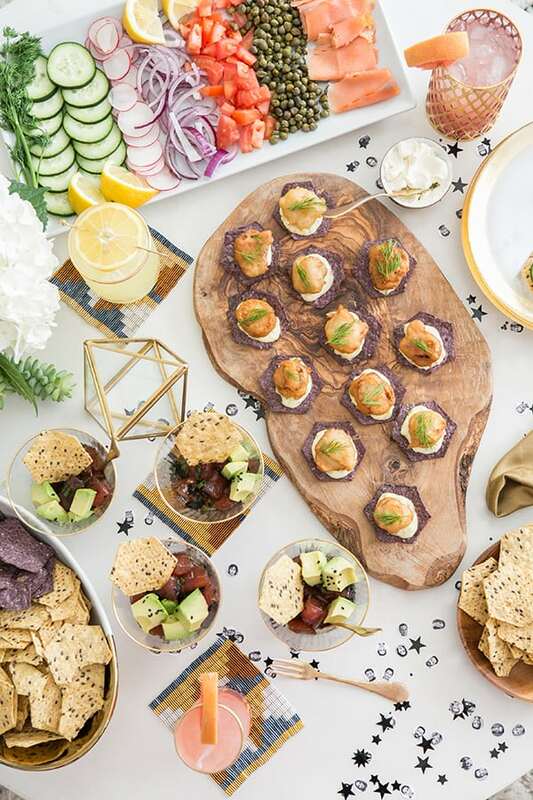 So, we teamed up with Food Should Taste Good to bring you some delicious Oscar appetizers, cocktails and party ideas!! 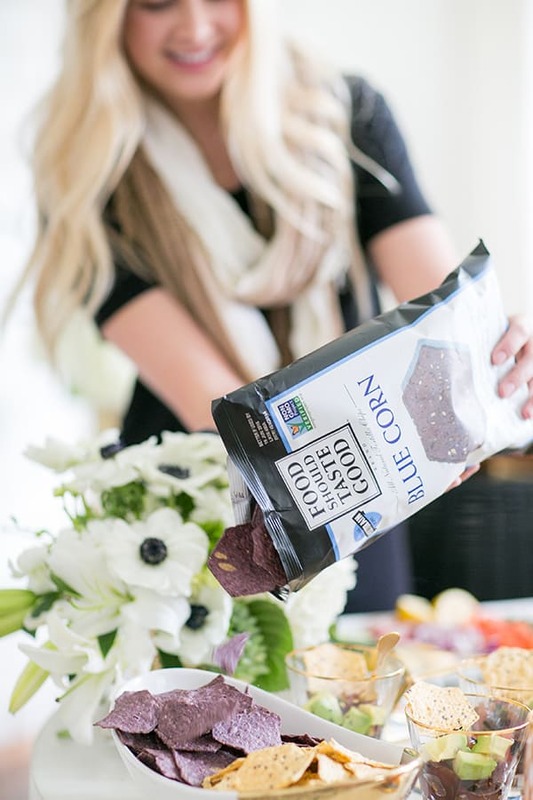 Food Should Taste Good chips are super yummy, but the best part is that they’re made with real ingredients, gluten free, trans fat free and cholesterol free! For these appetizers, we went for a fresh and light seafood theme and all of the dishes pair perfectly with Food Should Taste Good chips! This is the kind of food you could imagine being served backstage at the Oscars, but made easier for at-home entertaining. My favorite idea is the twist we created on “fish and chips”! 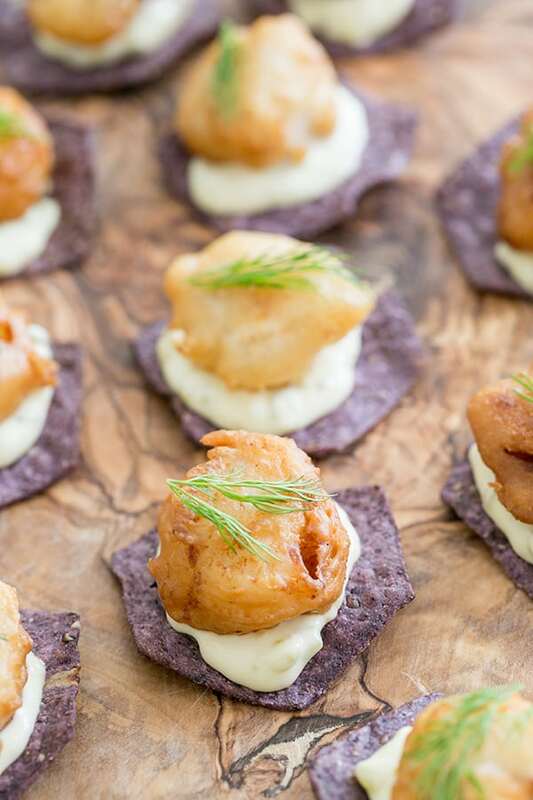 Homemade, fried battered fish on top of a blue corn chip, with a homemade tartar sauce. 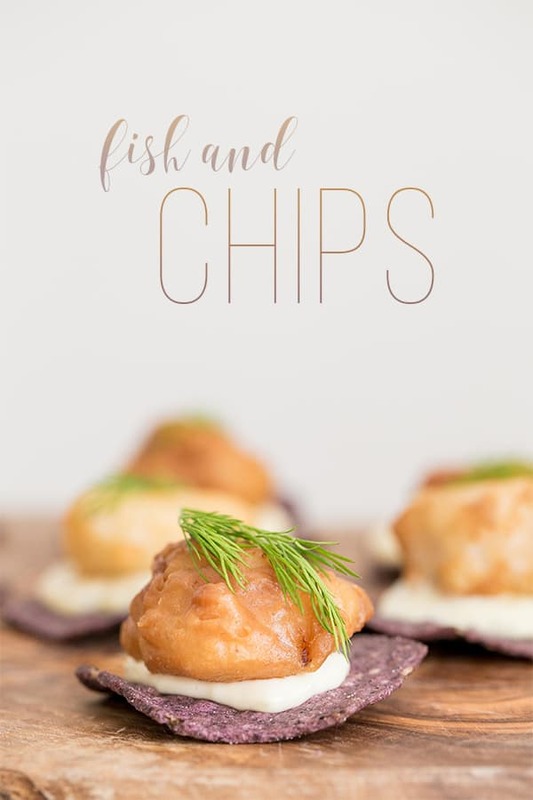 It’s absolutely delicious and such a fun take on traditional fish and chips! Recipe below! 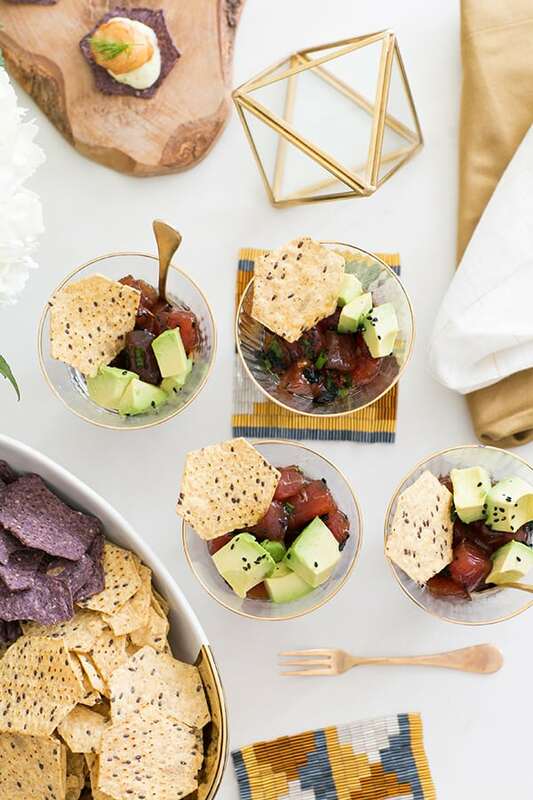 I’m also a HUGE poke fan and Ahi poke is perfect for parties! This recipe is so good and extremely easy to make! It pairs with Guacamole or Multigrain chips!! We made individual bowls of poke for the Oscar party and garnished with a chip. 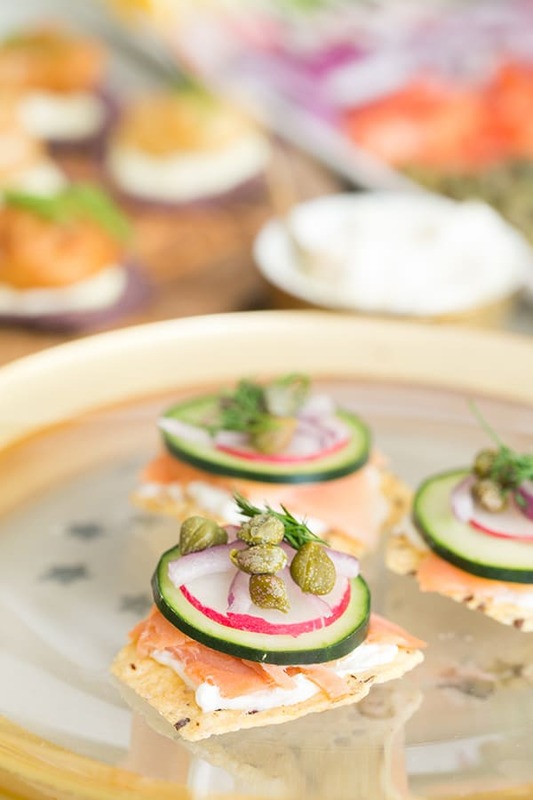 And since we love to give our guests choices, we created a build-your-own salmon canapés on Multigrain chips! We laid out capers, sliced onions, cucumbers, radish, smoked salmon and cream cheese, with a bowl of chips next to it. Perfect bite-sized appetizer. With these recipes and a little hosting charm, you’ll shining right up there with the stars! Lightly season the fish filets with salt and pepper, then cut into 1 inch chunks. In a bowl, combine the flour, salt, baking powder, water and milk and mix until combined. Heat the oil in a stainless steel, non-stick or cast iron pan. Emerge the fish into the batter, then scoop out a few pieces and add them to the hot oil. You should hear the oil simmer and crackle. Once one side of the fish is golden brown, turn and cook the other. Mix all of the ingredients in a bowl until combined. Scoop onto chips! Serve immediately. Dice the tuna into 1/2 inch squares. Add the tuna, soy sauce, green onions, roasted seaweed and garlic in a bowl and fold together. Divide between 4 small dishes and add sliced avocado, radish, sesame seeds and chili flakes on top! Serve immediately. You did such a great job with this! I would so eat all three of those things and your custom Oscar confetti is SO GOOD! Haha!! Thanks Jen!! Custom Oscar confetti will be a download for tomorrow’s post! Haha!! Those Ahi tuna bowls look amazing! I never thought of placing tarter sauce on a chip! Can’t wait to try this! Beautiful photography!